Last Thursday was my 29th birthday. It was also our wedding rehearsal. How's that for a memorable September 12th! It was honestly one of the best birthdays I've ever spent. Surrounded by my closest friends and family, the beach, and Mexican food for dinner... what can be better than that?! 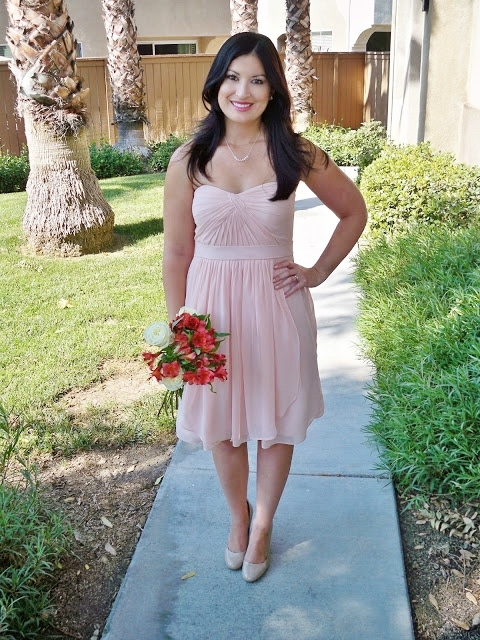 I decided to wear the bridesmaid dress I wore for my best friend's wedding. The peachy blush color also happens to be one of our wedding accents, so it was perfect for the occasion. I think bridesmaid dresses have come a long way, so I didn't think twice about wearing it again. I am getting married in 5 days! Eeek! Nervous, excited, nervous, excited. Then our honeymoon in Maui! I have a few posts lined up for the next two weeks, so please stop by and read :) I will do my best to keep up with my favorite blogs while I'm lazily lounging on a Hawaiian beach. I definitely will unplug to enjoy my honeymoon, but I'm sure it will be difficult to stay away completely. Also, expect to see an overload of sunsets, flowers, and the ocean on my Instagram. Thank you for reading, I love you guys! You are stunning! That dress is so pretty- so great that you were able to wear it again too. This is such an exciting time- soak in all in and enjoy!! You look beautiful! Love that you were able to re-wear the dress, it's so pretty. Enjoy the last few days of your engagement and enjoy every second of your wedding day. It absolutely flys by, but it's guaranteed to be one of the best days of your life. Enjoy your honeymoon and congratulations Mrs! Birthday twins! I can't believe the big day is almost here... so excited for you Noelle! Gorgeous dress.Happy belated birthday. We are birthday buddies.My sister and i were born two years to the day apart. The 12th is a good day to be born . Congratulations on the wedding and i hope you have a fab honeymoon. You look beautiful and hope you enjoyed your Birthday and wedding rehearsal! You're going to be one stunning bride!! Thank you, I appreciate it! I hope I look decent that day, I doubt I'll care much by that point! Thank you so much Ella! You look absolutely beautiful! I can't believe the wedding is so soon! I'm so excited for you. Sending lots of love and hugs for your big day!